On the Central Pacific Coast of Costa Rica, our Jaco horseback riding tours range from morning trail rides in the mountains high above the rainforest canopy to all-day expeditions to explore the rainforest to your heart's content. Discover all that this laid back surf town has to offer with a sturdy equine friend leading the way on one of our super fun horseback riding tours in Jaco. Fun for the whole family, Jaco horseback riding tours allow travelers to experience both beaches and jungles within the course of a few hours or a full day horseback riding excursion. Horseback riding in Jaco provides excellent opportunities for bird watching and getting close to timid wildlife hidden in the surrounding rainforest. Our bilingual horseback riding tour guides have eagle eyes peeled in search of the regions famous Scarlett Macaws, so have your cameras ready! Your family a little more adventurous? 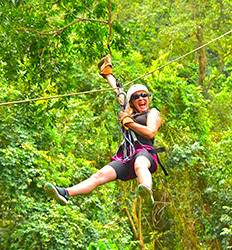 Add a little zip to your horseback riding tour in Jaco by choosing one of our Canopy tour combos. An activity to please the whole family and save money too! 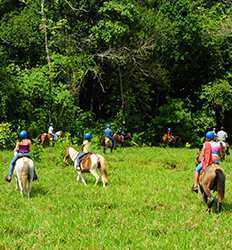 Our selection of horseback riding tours in Jaco can take you to the most beautiful places in all of Costa Rica, all the while making your journey the most memorable parts of your adventure in Jaco Beach. 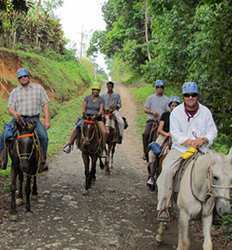 Take a look at all the Jaco Horseback riding options available to you and choose your favorite equestrian adventure!